VR is finally here, and our HTC Vive Consumer Edition review follows hot on the heels of the Oculus Rift, which was the first big-name virtual reality headset to ship out to consumers. After countless demos with the HTC Vive, first behind closed doors and then using it at conventions, it feels odd to finally be using the headset in my own home – but so very gratifying. I've used the consumer Oculus Rift and while I was impressed, the Vive's ability to employ room scale has convinced me that HTC and Valve have firmly secured the future of VR with this model. Hyperbolic as that sounds, I really believe that this is the beginning of something truly amazing. But this really is only the beginning. Convincing people the tech works has become easier now that the headset is shipping out, but there are still several barriers to entry – the first being the price point. The Oculus Rift costs $500 with the final cost around $600 after shipping, while the Vive surpasses it with the final cringeworthy cost sitting at £689. That's not including the PC set-up. 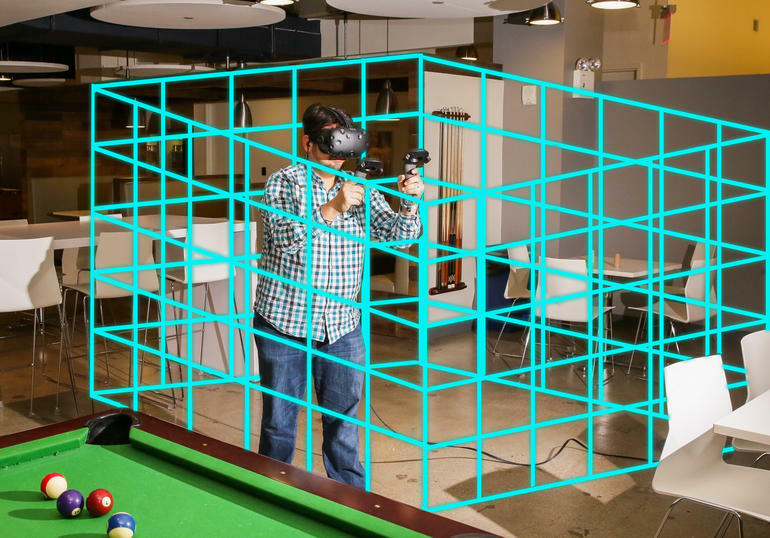 The second barrier may be easier to alleviate: lots of space is required to VR with HTC Vive. I've learned this the hard way since I live in a small San Francisco studio. Through a lot of furniture moving, I was able to make enough room for Valve's recommendations. Still, I ended up banging up my hand pretty hard once (really hard), and have often hit the wall or my desk in particularly frenzied bouts of Space Pirate Trainer and #SelfieTennis – both ridiculously fun games by the way. When not in VR, the rearrangements also don't make my living space practical. Here is an article about how to set up the HTC Vive – and while it's not too horribly complicated, it's likely different for everyone. Here's the rest of my experience with the HTC Vive. After you've gone through the motions of unboxing the 16 items HTC and Valve have shipped you (not every cord is needed but that's how many things you get), figuring out how best to place your two base stations (to drill holes or to not drill holes? ), connecting the cords, making sure all the programs are downloaded, you finally get to plop the headset on (phew). You're first met with a tutorial from a robot that fans of Portal will recognise, while standing in a white room. After some calibrations, you can start browsing your Steam game library – essentially a floating screen of Steam Big Picture. The background can be set to different colours, your own uploaded 360-degree images or pictures downloaded from the Steam Workshop (mine is currently the Normandy SR-2 deck from Bioware's Mass Effect). I can see this being a growing piece of customisation in the future with the possibility for dynamic backgrounds. From there, you can also change the chaperone colours – the grid that pops up when you're about to run into something – adjust sound, browse the store and do whatever else you normally do in Steam, with the aid of the controller which emits a laser pointer while the trigger acts as the 'mouse' that selects things. It's all pretty intuitive and simple. HTC has its own little platform that you can open which is essentially the same thing: a games library. However it looks like more features will be added down the line. You're better off just choosing Steam from the get-go though since HTC's portal opens it up anyway. On first glance, this Vive doesn't look too different from the Pre version, though it's definitely smaller and comfier than its very first iteration. It won't win prizes for design though. 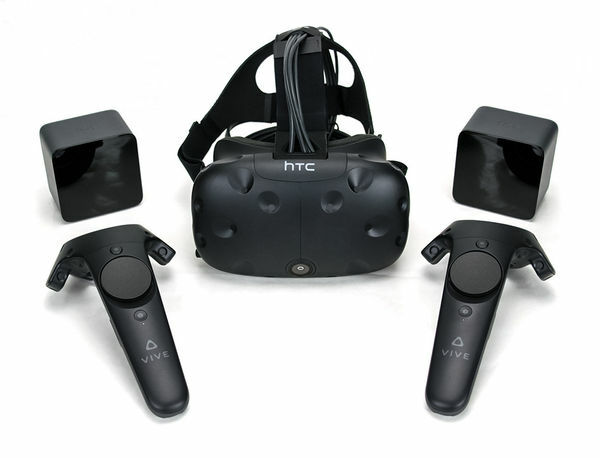 Unlike Oculus Rift, which is designed beautifully, HTC and Valve seem to have chosen function over form. Regardless, you look ridiculous with any headset strapped to your face, punching things that no one else can see. 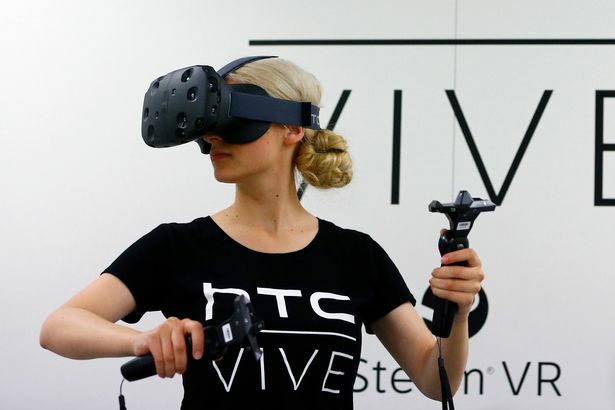 With swappable foam inserts and what HTC is calling a nose gasket, as well as adjustable straps to get the fit right, the Vive can be worn comfortably with different shaped heads. And yes, you can use it with glasses thanks to the slotted spaces for specs. My glasses are on the larger side and they fit nicely into the HMD. It does take some strap readjustments before it's completely comfortable – more than for the non-glasses wearers – but it does work. Just remember to loosen the straps again when taking it off otherwise it will pull your glasses off with it. I've been using the Vive for several hours a night for a solid week now without discomfort or motion sickness – and I'm someone who can't even read on the plane or look down at my phone for long in a car without feeling sick. So far, the VR experience itself on Vive is fine but it really depends on the game being played. I've only tried about half of the 35 VR games I've downloaded so far, and haven't felt the slightest bit of nausea, but I haven't done anything like Rift exclusive Eve: Valkyrie yet, which does make me feel queasy after 10 minutes. The overall headset weight, straps and faceplate are also hardly noticeable after two hours. I do get pretty sweaty though and on occasion, have to tighten the straps if I'm playing a particularly rigorous game where I've swiveled around a lot causing the headset to loosen. Miraculously, the lenses don't get fogged up – something that's is a huge annoyance when using the Samsung Gear VR. In my time with Rift, I always felt like the Vive was much heavier but again, I didn't really notice it. Perhaps if I went a straight four or five hours, especially after running around, the Vive would begin to weigh down on me. ThePlayStation VR feels like it's on the same page as Rift – a bit lighter and less unwieldy. The HTC Vive is of course, tethered to your computer. I was initially worried about this: what if I trip? What if I yank the computer off the desk? Actually, though, it's been fine. There are definitely times when I get twisted up, but I've learned to sidestep it now and figured out how to avoid the cable. And thankfully the length of the thick cords gives you plenty of leeway, preventing you from destroying your tech set-up. All in all, the Vive is a comfortable experience. It does feel weird when you leave VR, though. I don't mean motion sickness, rather that my eyes are extra tired and I feel the need to drink a giant glass of water. It's not anything out of the ordinary though – I get the same fatigue playing countless hours of games on the computer or console. 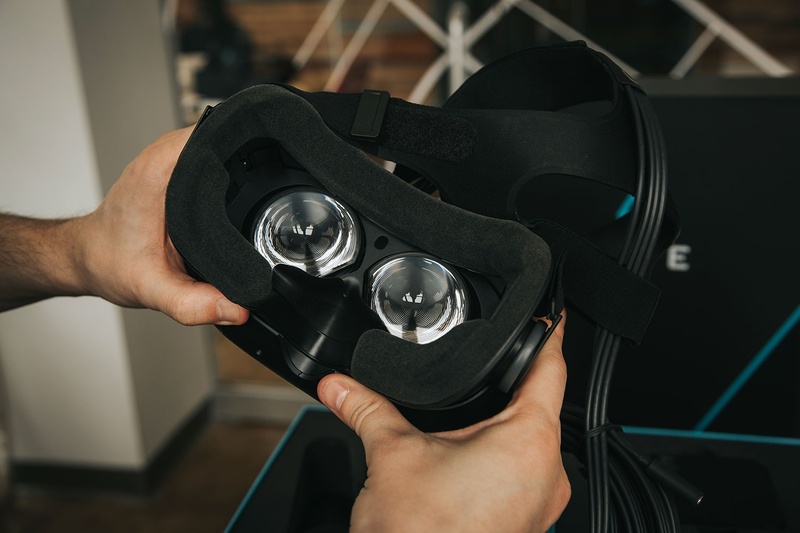 The Vive features two 1080 x 1200 screens with 90fps refresh rates and a taller than usual 9:5 ratio which expands how far up and down you can look without moving your head. What does that pixel count mean? You can still see pixels if you're really trying, but generally this resolution is superb for tricking your brain into forgetting you're wearing a headset. The resolution really is superb. Stepping inside Vive is breathtaking. I often forgot that I was inside a fake world where I couldn't lean against counters inJob Simulator or pet fish swimming by underwater in theBlu. While you're far away from objects, everything looks crisp and clean but as you lean in closer or pick things up to observe them better, it becomes less life-like as the pixels are smoothed out. The Gallery: Call of the Starseed is all about picking things up and looking at them (or chucking them) but I'd find myself hitting the headset with the controller and seeing that things weren't as clear close up.Final Approach is also like a giant, virtual Sim City that beckons you to lean in, but as you do, it looks less defined. There have been complaints of a screen door effect, where you can see the lines separating pixels on HMDs, but I haven't noticed it with the HTC Vive, though I have seen very slight stuttering here and there if I turn my head too fast. But this was hardly an issue – more like a blip during various games. I noticed the other headsets have this problem too with Rift and PS VR both emitting a greater screen door effect than Vive and stuttering on occasion. In fact, during my time with Rift, turning my head would cause a bit of lag that's more apparent than Vive. This may be because the Vive has greater tracking abilities and is able to amend itself more quickly, while Rift only has the one. Head tracking on headsets such as the Oculus Rift still remains impressive, but the Vive takes things up a notch. The 37 sensors on the headset are just part of 70 in total (including those in either controller), pick up signals from two wireless infrared emitters placed in two corners of the room. The result is that not only can Vive track your head as it looks up, down and side to side, but it also tracks where you are in a room and what movements your hands (controllers) are making in relation to where you're standing. From Job Simulator to Final Approach, the Vive's base stations tracked my hands perfectly. Picking up objects to cook robots food was easy as pie, while guiding planes in for landing – and making them do aerial loops along the way – was wonderfully accurate. I could be reaching up to a high shelf or picking things up from the floor and the 1:1 ratio held. It's not the same finger tracking as the Oculus Touch controllers but in general, everything worked as promised. From the desktop's Steam VR settings, you can switch the front-facing camera on and off. I found this to be cool because of all the shapes chaperone is able to recognise, and it does help when I'm searching for a controller I've put down or when I want to make sure I'm not going to stub my toe (again). But it does take you out of the experience when it's constantly on. Thankfully, you're able to toggle between on and off in with the press of the home button (the one under the trackpad). Aside from solid tracking, the Vive's PS Move-style controller sticks are quite large when compared to the Oculus Touch controllers, but they're a lot less unwieldy than the original, blocky models. As I mentioned before, there's no finger tracking that lets you do a thumbs up or get really grabby. I'd say the functionality of Touch is better but Vive's tracking may still outweigh its usefulness – we'll have to find out later this year when Oculus launches its controllers. Wireless and battery powered, the controls include a dual stage trigger button under each forefinger, a home button and a similar, textured circular touchpad as before. Haptic feedback helps to let you know when you've completed the correct action. As with any new controller, there's a learning curve – especially when most games don't tell you what the controls are or help if you forget which button to press. If you have small hands you may find yourself juggling these a little in apps which require you to swipe across the touchpad, for example, but generally, they're easy to get the hang of. It's also worth noting that you're essentially gripping these the whole time, no matter what you're doing, so any gestures that involve fingers and thumbs aren't really possible. I've been able to get a surprisingly long life out of the controllers. After two to four hours of usage over three days, I had to recharge. The battery ended up lasting six to seven hours, which is a little longer than the four hours promised. There's no indicator of low battery life in game – your controller will simply die – so that would be a nice addition for the future. You can see the battery level if you're on the main menu screen since there are virtual indicator lights but once they become hands in a game, the lights disappear. 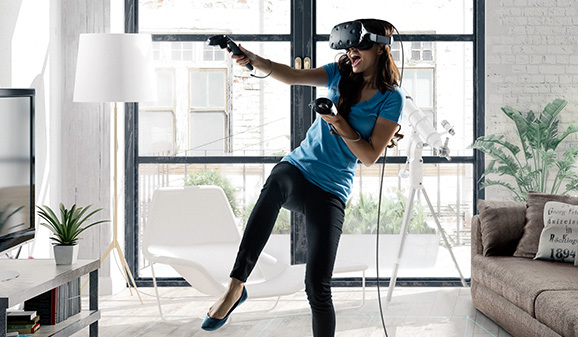 With the Vive, you get the option to sit or stand, offering you the best of both worlds. Standing does mean you'll need more room to move around but it's completely worth it. Called Room Scale VR, you can set up a virtual rectangle that allows you to walk inside the confines of a VR space. The 'chaperone' grid I mentioned before ensures you stay within the bounds. Not only do games feel more immersive with room scale, you're not being a lazy bum. You're not exactly running or practicing evasive manoeuvres, but swinging your arms about and standing up are still far healthier than sitting all day long. Games like Audioshield and the aforementioned pirate and tennis titles force you to raise your heart rate a bit more than normal. EvenTilt Brush has you moving to create art because you can look at your work from different angles. Sitting experiences have their merits as well, but you're mainly moving your head around instead of your whole body. Time MachineVR is a sitting game but it's beautifully crafted and lots of fun, exploring the world of sea dinosaurs. Most puzzle games, like Water Bears VR, can also be played sitting since you don't have to move much. However, what I like a lot about the Vive is that, unless restricted by game type, you can stand up if you want to. Granted, you have to switch between standing or sitting in the settings, but standing with room scale is a real winner. There's a large catalogue of games, but right now there's nothing that's particularly compelling. Rather, it feels like a bunch of mini-games with tons of bugs and an irritatingly, not enough of a tutorial for each title. Don't get me wrong, it's all still fun and I still get sucked into hours of play. Sometimes simple is also better – like in Audio Shield which feels like an exercise video in disguise. Or even Tilt Brush where creating art is endless. But really fun games like Vanished Realms and Time Machine VR only have so much story before they give you a "coming soon" message, and#SelfieTennis has zero instructions or purpose. While I enjoyed trying out the different types of puzzles, shooters and so forth, I was still left wanting at the end. Perhaps it's because the concept of a VR game is too novel and developers aren't sure how long to make a game. Or maybe it takes a little longer to slap together a well-made VR world. Whatever the case, I'm done with demos. In general, you'll mostly find games for the Vive and some experiences where you simply watch stuff happening. There's also the Vive's ability to connect to iPhones and Android devices to deliver alerts and messages when you're in VR. The feature wasn't made available during testing, though Valve has assured us that it will be out this week. Called Vive Phone Services, it seems like it's supposed to help you spend time in VR games and movies while keeping in touch with the real world. Speaking of movies, there aren't very many to choose from for Vive at the moment. Penrose Studio's The Rose and I was the closest I came to watching a VR movie with Valve's headset. But even then, it's not really a movie since it's only a few minutes long. It's unclear whether HTC and Valve will add more than games and short experiences, so currently non-gaming fans will have to turn towards Oculus Rift and Gear VR. 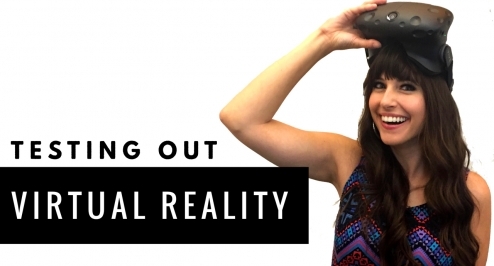 I don't think I'll ever get over the giddiness of putting on the HTC Vive headset and leaving reality behind. Yes, I did get tired after a while, but I was more active than I've ever been playing video games (I don't own a Wii or have PlayStation Eye or Kinect games). As much as I've enjoyed the Oculus Rift, I love how Vive lets me roam around. Even though the games are mediocre, I still believe that room scale is where HTC and Valve have got it perfectly right. I don't want to sit in a chair in VR, I want to be inside VR and that's what Vive lets me do. However, this is both freeing, and a limiting struggle. You really do need to clear a decent amount of space to avoid accidentally breaking your controller, or even body. I suspect injuries won't be serious and my Vive controllers have been very hardy and durable, plus there's the chaperone system to help guide you. Still, it would be nice if the grids didn't have to appear so often warning me of impending danger because my space is so small. The games and experiences also need more polishing. While there's plenty to choose from, it's like someone offering you FarmVille or Candy Crush. Sure the simple VR titles are fun and immersive, but you can only play these kinds of games for so long before you get restless and need a greater overarching story. I'm not asking for the next great RPG from Bethesda, but something complete, without too many glitches, is needed to make it seem like Valve and HTC are serious. The interfaces and tutorials need to be cleaned up (or added) as well. Developers should remember that not everyone has used VR before and it's a completely new experience even for seasoned gamers. It's frustrating spending time trying to figure out what buttons correspond with the actions I'm looking for. Vive's also hardly accessible by the masses at such a high price – it's likely only techies and early adopters will get in on the fun at first. But until that fun encompasses better games and more experiences as a whole on the Steam and HTC platform, it should be OK.